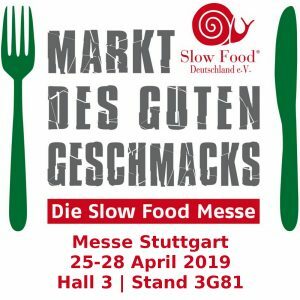 The reference appointment for food specialties in Germany is back: the Slow Food fair at the Stuttgart exhibition center. Now in its 13th edition, the annual exhibition-market allows the consumer to get in touch with high quality products and buy the food specialties and wines presented directly on site. With about 15,000 square meters of exhibition area, it is the main event of the Slow Food association in Germany and is confirmed among the major events for food companies that will present a unique variety of regional specialties, produced according to tradition and according to the rigorous principles of Association. We are waiting for you from 25 to 28 April 2019, Hall 3 | Stand 3G81.